Once called “the machine shop of the world,” Milwaukee, Wisconsin, is still home to thousands of industrial properties, including breweries, factories, warehouses, mills, tanneries, and foundries. Many of these buildings and neighborhoods are potential candidates for listing in the National Register of Historic Places, which qualifies them to receive Historic Tax Credits that encourage redevelopment. But the Wisconsin State Historic Preservation Office (SHPO) needed to know where all of Milwaukee’s prospects were. SHPO hired the cultural resources team at Mead & Hunt, Inc., to conduct an exhaustive survey of the city’s historic industrial buildings. Both parties knew they would need a GIS-integrated approach. So Mead & Hunt’s team, which included architectural historians and GIS specialists, used ArcGIS to efficiently review and record large numbers of historic resources in the field and then seamlessly transfer that data to SHPO. Collector for ArcGIS allowed survey teams to record data on industrial properties in the field and then convey it directly to the client as digital deliverables (i.e., shapefiles, databases, and digital photographs) rather than enter each record manually into an online database. 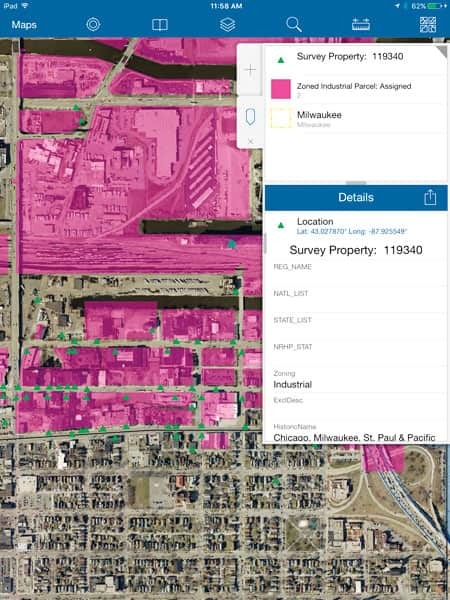 To provide comprehensive survey coverage, the project team needed to identify industrial properties within Milwaukee’s city limits that were more than 40 years old. But instead of going straight into the field, Mead & Hunt used GIS data from the City of Milwaukee, along with other existing data sources, to first determine the extent of the survey area and then build field survey maps. The objective was to determine the locations of known historic industrial buildings, as well as previously unrecorded properties. 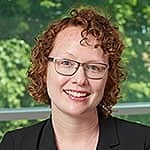 “GIS analysis of the existing datasets refined and narrowed both the geographic scope and the temporal extent of the data based on project parameters,” said Brauna Hartzell, a GIS analyst at Mead & Hunt. To begin the process, Mead & Hunt obtained the Wisconsin Historic Preservation Database as a shapefile from SHPO, which contains points for previously recorded historic industrial properties throughout Milwaukee. The project team then worked with SHPO to come up with appropriate industrial activity categories—such as “tannery,” “brewery,” and “manufacturing”—and mapped all the properties in the database using ArcGIS Desktop. Mead & Hunt ended up with a total of 546 already-recorded properties that fit into these categories. Next, Mead & Hunt needed to identify additional industrial buildings that had not yet been documented. Using the City of Milwaukee’s GIS-based parcel data, the project team found all the lots in the city that were zoned for industrial use. The plan was to have surveyors review these parcels in the field to determine if there were any other buildings that fit the survey criteria. This produced more than 1,400 industrial parcels that needed to be added to the survey. Mead & Hunt overlaid those 1,400 parcels with the 546 previously surveyed features to define the combined survey area. This would enable the project team to pinpoint individual industrial properties and concentrations of industrial buildings that had the potential to be included in the National Register of Historic Places. Along the way, if surveyors encountered any additional industrial buildings on those parcels, they would be able to use Collector to add new features to the point layer. And the whole survey would be conducted offline so surveyors could compare and check the data before uploading it to ArcGIS Online at the end of each day. 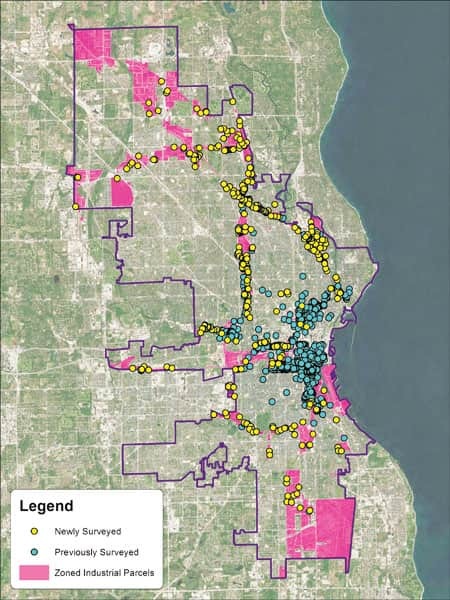 Mead & Hunt mapped data from the City of Milwaukee and the Wisconsin State Historic Preservation Office (SHPO) that identified zoned industrial parcels (pink) and previously surveyed industrial properties (blue). The company also mapped newly surveyed buildings (yellow). 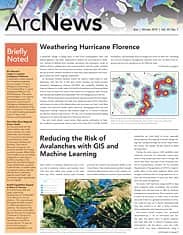 “The [Collector for ArcGIS] app provided the necessary functionality to conduct [this] survey over an extensive area in an offline environment with multiple teams of surveyors,” said Hartzell. Once the survey was complete, all the final data would then be downloaded to ArcGIS Desktop for use in project deliverables. Mead & Hunt sent four people in teams out into the field with Collector. It took them just 10 days to visit all 1,946 properties that had been flagged for the survey. To discern whether an individual industrial building was a likely candidate for the National Register of Historic Places, the field teams scouted properties that looked exceptionally historic or had interesting architectural features. They also searched for places that appeared to be associated with important Milwaukee manufacturers—including former automobile (and current water heater) manufacturer A. O. Smith; clothing and textile producer Eagle Knitting Mills; and the Allen-Bradley Company, which got its start producing electrical controls. The buildings ranged widely in their industrial use, from manufacturing beer, boots, and steam engines to producing candy, caskets, and straw hats. Many potentially significant properties were less obvious, however. Using ArcGIS Desktop, the project team displayed the survey data on a map and symbolized the buildings based on when they were built, the types of industries they were used for, and other attributes. This helped the team see concentrations of historic buildings and identify trends that revealed the context of industrial development throughout Milwaukee. Being able to visualize all this on a map allowed Mead & Hunt to begin identifying potential historic districts. Using Collector for this data-gathering project not only streamlined fieldwork operations, enabling surveyors to track their progress and easily navigate from one industrial parcel to the next, but it also offered several other advantages over traditional pen-and-paper survey methods. For example, developing the survey form in Collector allowed Mead & Hunt to preserve the schema that the Wisconsin Historic Preservation Database uses. This, in turn, enabled SHPO to easily reintegrate the survey records into its own database, eliminating the need to manually enter descriptive data from individual paper forms. Similarly, SHPO was able to obtain property locations without having to digitize each point. With what ended up being more than 900 records in the completed survey, this saved substantial amounts of time and effort. By the end of the survey, the project team had a spreadsheet that could be seamlessly incorporated into the Wisconsin Historic Preservation Database. It also had a point layer containing all the surveyed properties, which SHPO now uses in the interactive map feature embedded in its online database. The results of the survey provide a comprehensive overview of Milwaukee’s industrial heritage. 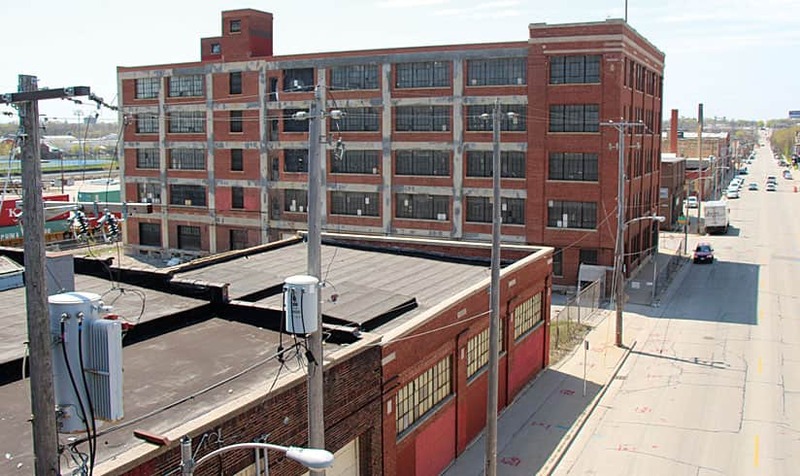 Multiple local developers and nonprofit organizations are already using them to assist in identifying industrial properties that are suitable for redevelopment. The West St. Paul Avenue Industrial Historic District was one of two potential historic districts identified by the study. Through the survey, Mead & Hunt distinguished 39 historic buildings and two historic districts—the Layton Park Industrial Historic District and the West St. Paul Avenue Industrial Historic District—as prospective candidates for listing in the National Register of Historic Places. These properties could undergo significant rehabilitation with help from Historic Tax Credits, which would make it easier for local developers to turn the buildings into apartments, offices, and other commercial entities. In fact, since the Historic Tax Credit program’s inception in 1982, it has reinvested $526 million in Milwaukee’s historic properties—hopefully with more to come. Large-scale survey projects, like the one Mead & Hunt conducted for SHPO, greatly simplify the process of evaluating properties for historic preservation. 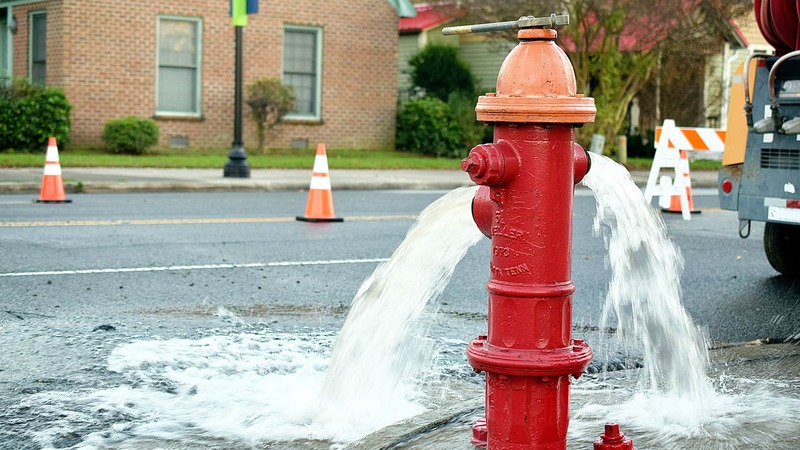 Employing ArcGIS technology makes the fieldwork more efficient and streamlines the digital deliverables. This not only helps open doors to redevelopment opportunities, but it also enables cities to understand more thoroughly the contexts from which they emerged. For more information about how Mead & Hunt is using ArcGIS solutions to conduct cultural resource surveys, email GIS team lead Sebastian Renfield at sebastian.renfield@meadhunt.com. Angela Hronek is a cultural resource specialist at Mead & Hunt. She has more than three years of experience using field surveys, photographic documentation, GIS, and additional research to tell the history of various buildings and communities. Sebastian Renfield is a cultural resource specialist at Mead & Hunt. He has more than seven years of experience documenting, evaluating, and researching historic buildings and structures. 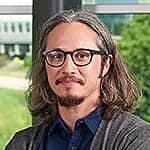 GIS technology plays an integral role in his efforts to map and analyze culturally significant properties.